As a rumored protest fizzled just outside the walls of the meeting room, the Chatham County Board of Commissioners set aside a date and time to hear public concerns and comments about the “Our Confederate Heroes” statue in front of the Chatham County Historic Courthouse in Pittsboro. 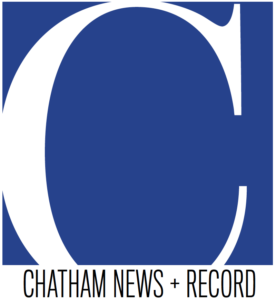 The commissioners’ next meeting, slated for 6 p.m. on April 15, will be held at the Chatham County Agriculture & Conference Center to allow for presentations and suggestions about whether the statue should remain where it is. 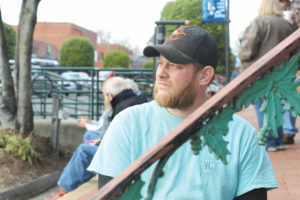 That didn’t stop multiple residents on both sides of the issue from speaking during the public comments period at Monday’s county board meeting, even though the monument wasn’t a topic on the night’s agenda. 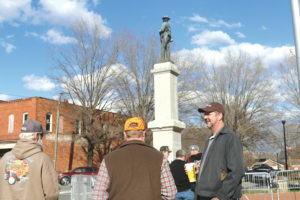 Chatham resident Steve Roberts, donning a T-shirt with the image of a monument similar to the Chatham statue, ended his remarks with “God bless the South” as he argued that the Civil War, or at least those in Chatham County who fought for the Confederacy, was not about slavery but about people defending their homeland. Another speaker was Elizabeth Haddix, co-director of the Julius L. Chambers Center for Civil Rights, a nonprofit that, according to its website, is dedicated to “providing low-wealth North Carolina communities with sound legal representation in their efforts to dismantle structural racism.” Haddix, who referred to herself as a “Southerner to (her) core,” called for the statue to come down. Parker Stockdale, who said he had ancestors who fought on both sides of the Civil War, commented that he was “concerned that some people in our midst” misunderstood the place of North Carolina in the Confederacy. Howard Fifer, who said he would be among a group presenting at the April meeting, asked community members to pursue a “civil discourse” about the statue. The commissioners made no comments on the public speakers. The meeting came after what can only be termed a “gathering” of individuals outside the courthouse by the statue that started around 4 p.m. Multiple people milled about in the area and talked amongst themselves. The Chatham County Sheriff’s Office had set up partitions around the statue and the brick walkway in front of the Historic Courthouse. 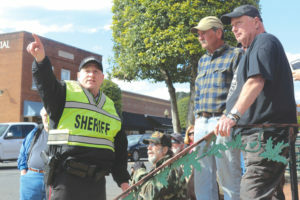 Lt. Sara Pack, the sheriff’s office’s public information officer, told the News + Record that the partitions were designed to “help facilitate pedestrian foot traffic in and around the traffic circle” prior to the commissioners meeting and the Pittsboro Board of Commissioners’ workshop covering Chatham Park’s tree protection ordinance at the same time.